Your audience deserves the most user-friendly experience when it accesses the webinar interface. Ease of use results in greater engagement with your content. Especially new prospects are less forgiving of errors or webinars that are not intuitive to access. Even great webinar content may end up not being viewed if the registration process or webinar interface are not user-friendly. The main objective is to ensure your webinar console is engaging and up to date. If there are outdated links and buttons to several features, make sure these are checked and improved before you publish a new webinar presentation for your audience. The look and feel of a webcast to your audience is vital to any presentation. As mentioned earlier, some audience members get turned off by the slightest errors or unimpressive features that they think are irrelevant or useless to them. One of the first steps to take is to improve the audience console. This can be done by addressing the design standards in order to produce an integrated viewing experience across all platforms, devices, and screen sizes. Enhancing the graphics, widgets, icons, buttons, and any other element (human interface) used by the audience will enable you to continually update the console as their needs and expectations change. Keeping an updated version of the webcast audience console will help you in providing the ‘ideal’ look and feel of the design, which, in turn, can be totally appealing to your audience. Preview features allow you to see the possible end product prior to converting every element to their final form. Of course, the only way to know if these changes are good is through testing. You can conduct a survey or send a link to some of your existing clients for them to test the new console design. This is also a great opportunity to look into the ever-changing expectations of your audience when it comes to the webcast console you are providing to them. Enhanced Multi-Registration Feature – This makes it more efficient in adding customisation options such as banners, style editing features, page setup, language support options, etc. Add to Calendar Feature – Customisation of the calendar invitation can be done through this enhanced feature. You can customise the email notifications of the calendar reminder – i.e. the subject and message you send out to the audience. Multiple Slide Decks – If you want to add multiple slides and video clips onto your webcast, this feature is a must. These features are often used as references or resources in support of the subject matter being presented via webcast. Webcast Simulation – Webcast simulations are often made to look like real live webcasts for promotional purposes. This feature usually runs less than thirty minutes. Updated Widgets for Mobile Platforms – Typically, the widgets for mobile webcast should provide a robust experience to your audience. You can include social sharing, contact us, and email/friend referral widgets for more reach. Media Player Enhancement for Mobile Audience – Among the enhancements you must include for mobile players is the disappearing media bar. This feature provides audiences a larger view of your video presentation. Social Sharing Widget – There are numerous social sharing widgets that you can simply add at once and you’ll get hundreds of icons of social sites they support. If you know your target audience pretty well, you can easily select and include the necessary social icons onto the webcast console. Presenter Bio Widget – If you already have this on your webcast console, a better-looking one would be to include links or buttons to the presenter’s social profiles. By doing so, the audience will find out more about the presenter. 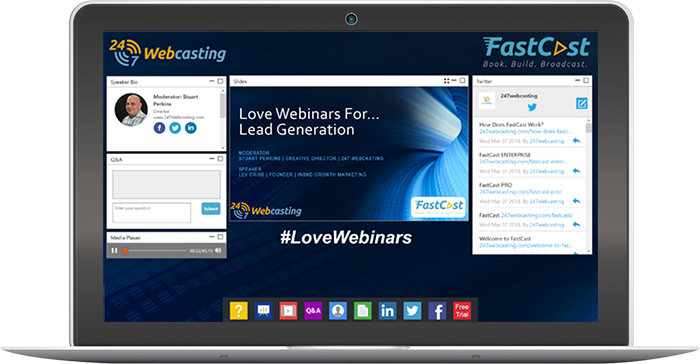 These are just several enhancements you can implement in order to prove a better webcast console to your audience. As always, it is best to test any changes and to involve a sample group from your audience to get their feedback.